Released in 2007 to commemorate the twentieth anniversary of the Italian publishing house, the Lo Scarabeo Tarot combines elements from 3 major traditions of tarot decks: Marseilles, Crowley-Thoth, and of course Rider-Waite-Smith. The art is adeptly painted by watercolorist Anna Lazzarini. On the Temperance card we see the angel with a Taijitu, the Yin/Yang symbol on her bosom, and her wings are both light and dark. She represents the compassion and understanding that is only possible when a soul has attained a state where it transcends. 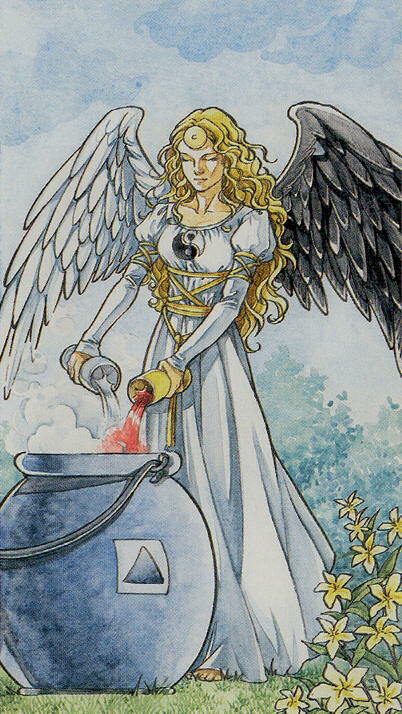 Duality's blood and water flow from the vessels she carries into the cauldron she is attending.